Don’t you hate it when it’s late and you’re tired and okay, maybe you’ve been drinking a little bit, when all of a sudden you slip and fall into a giant martini glass full of milk? No? Really? Well all right, if you’re about that life. 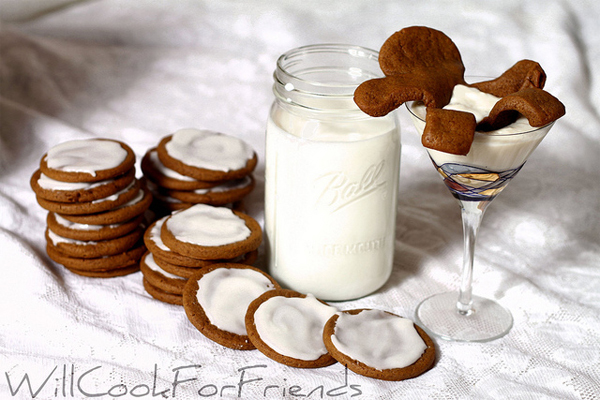 For those of you who’d rather watch other people get hurt than get hurt yourself though, here’s a recipe for Drunken Gingerbread Cookies which is sure to have all your holiday guests slipping and sliding. Maybe not from the alcohol (only 3 tablespoons’ worth), but definitely from trying to get a hold of your oh-so-delicious cookie recipe, amirite?